Born in Jacksonville, FL, Colleen played two-years at Florida State University where she earned Team MVP honors and led the Seminoles to a top 20 finish at the national championships. Turning professional, Walker would go on to win nine times on the LPGA Tour — including a major at the 1997 du Maurier Classic. 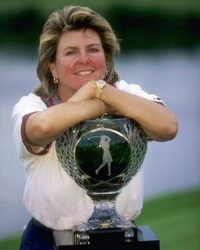 In 1998 she captured the Vare Trophy for season-long low scoring average. Walker would join the Legends Tour, capturing one title and winning the Heather Farr Award for dedication and inspiration to the game of golf. Unfortunately, Colleen passed away from breast cancer in 2012.